My friend Lori Anderson invited me to take part in a Memories and Thanks blog hop. Lori's events are always fun and meaningful, so I signed up. Plus, it was back in November, and how could anyone possibly know back then that there wouldn't end up being any extra time between November and January 12! Some of you know that my husband Mike had heart surgery right after the holidays. He is recovering very well, but we won't know if it's been successful for several more months. It was a non-open heart procedure called cardiac ablation, intended to cure atrial fibrillation. Cardiac ablation is considered minor heart surgery, but you can go tell that to someone who isn't in love with the patient! Like many people with moderate to severe A-Fib, Mike is athletic, lean, and extremely healthy in all other ways. We have great hopes now that after the monitoring months are over, Mike will be able to go completely off all of the nasty drugs that have been making it hard for him to live his life. So, long story short, I have had to pull out a previously made piece, and I am dedicating it to my DH, whom I am very very glad I did not lose last week. 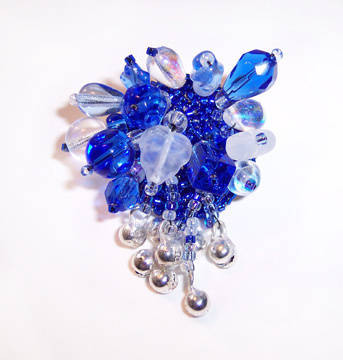 I am planning on sharing the tutorial for this pin, which is beaded onto metal mesh, in a few weeks...so stay tuned. I think it's a joyful pin, don't you? So sorry to hear that the holidays were stressful, but so glad to hear your husband is doing well. The piece you selected is beautiful! Beautiful pin, blue is my favorite color. I hope your husband has a full recovery and is able to get off all the medication. I'm sure others will join in sending your husband good thoughts for a speedy and successful recovery! I'm a stranger out here in blog land but I have to say I'm glad you didn't loose your husband either. Wow! I'm glad you shared with a piece you had done before...it's beautiful! All the best to you and your family! Your pin is quite joyful. I hope your husband recovers in good health very soon! Hi Cyndi, You do wonderful beading. Hope all goes well for Mike. Thank you for sharing and I love your pin! I hope you husband makes a speedy recovery and you get the results hoped for! Your blue pin is gorgeous!! Super cute, can't wait for the tutorial. Good luck with the results on the surgery. Every bead tells a story, so true, so true - I wish you all the best for your husband. Prayers for healing for Mike, prayers for comfort for you! The pin is lovely and exuberant! It is indeed a lovely and joyful pin. So glad to hear that your husband is doing better! Beautiful pin. Hope your husband has a speedy recovery.